It is the seventh day and we are a little tired with all the enthralling and soul-filling journeys, with the beautiful mountains and the wonderful palaces. Today let us do the packing and carry the essentials. So these are the things you must not forget. 1. Keep your passport safe if you are a foreigner. 2.Keep enough cash, the ATMs are plenty, but the cash gets exhausted and it can not be refilled if there are holidays continuously. Also, keep enough change. 3. Stock up on essential medicines and sanitary essentials. 4. Carry a bottle of water. 5. Keep a lightweight blanket, you never know when you will need it. 6. Keep a newspaper or two, you don’t know if your seat is clean. Well, it has many uses. Just keep it. 7. A book. It is a must, try to keep Reader’s Digest, it ain’t bulky and yet a very good read. Lucky you if you have a Kindle. 8. Power Bank. If you don’t have a hard copy and your mobile is drained out you will not be allowed to enter inside the train/bus. 9. A proof of ID. Any one of the proof of ID is nowadays compulsory. So do not move without it. It is a must. 10. Carry some chocolates, packaged juice and apples. Avoid outside food while travelling to eschew from frequenting the washroom. You can satisfy your taste buds after you land in that place. We are cool to go now. So stay tuned to embark on a journey and experience Incredible India. 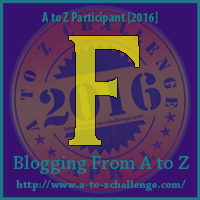 I am participating in the #A-ZChallenge. My theme is A-Z of travelling in India. Come along and take the journey with me to experience incredible India.